Not much going on here at the moment, so not much to blog about. It is really sunny and warm which is new. It is the picture perfect SoCal end to January. 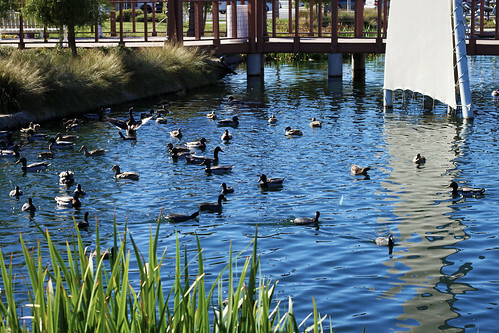 Taking a few moments to feed the ducks always improves my mood. I grabbed my camera as I headed to the grocery store. Isn’t it nice that they built a lake when they put in the strip mall on the corner? As you can see there are lots of ducks to feed. 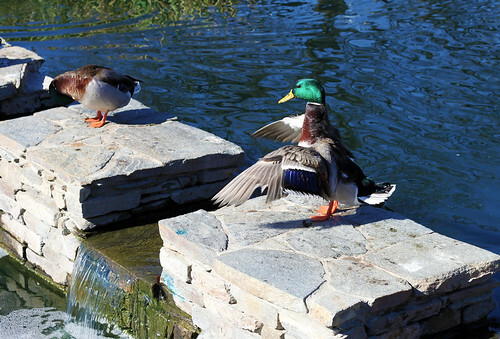 I did get one photo that had a bit of interest, a duck was stretching his wings. This entry was posted on Wednesday, January 30th, 2013 at 5:44 pm and is filed under Photography. Tagged: Photo. You can feed this entry. You can leave a response, or trackback from your own site. Wondered where our pond ducks wintered over! That looks like Henry & Sophie!! Lovely images – and oh to imagine the warmth of your sun. We have 7″ of new snow and are headed to 17 below tonight. Enjoy your day and wishing you a good weekend.